Schwartzman was born in Los Angeles, California, the son of actress Talia Shire (née Coppola) and the late producer Jack Schwartzman. Schwartzman's brother is actor and musician Robert Schwartzman, and his paternal half-siblings are Stephanie and cinematographer John Schwartzman. 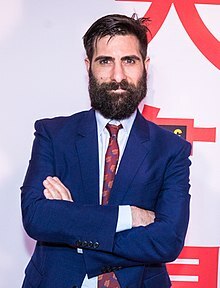 Many other members of Schwartzman's family are involved in film and entertainment: he is the nephew of Francis Ford Coppola and Anton Coppola; cousin of Nicolas Cage, Sofia Coppola, Roman Coppola, and Christopher Coppola; and grandson of Italia Coppola (née Pennino) and Carmine Coppola. His first cousin once removed, his father Jack's first cousin, is novelist and screenwriter Elliott B. Oppenheim. His paternal grandparents were Polish Jewish immigrants, while his mother is Italian American and Catholic. He attended Windward School in West Los Angeles. Schwartzman made a cameo appearance as Ringo Starr in the biopic spoof Walk Hard: The Dewey Cox Story. In 2009, he appeared as Mark, a C-list television star, in Funny People. He also voiced the role of Ash Fox in Wes Anderson's animated film, The Fantastic Mr. Fox, which he described as, "the best movie I’ve ever been a part of." He starred in the HBO show Bored to Death, in which he played a writer who moonlights as a private detective and puts himself up for hire on Craigslist. In 2009, he starred in The Marc Pease Experience. In 2010, he played Gideon Graves in the film Scott Pilgrim vs. The World, the movie adaptation of the comics by Bryan Lee O'Malley. In 2011, Schwartzman made a cameo appearance as Vincent van Gogh in the Beastie Boys short film Fight for Your Right Revisited. In 2013, he made a cameo appearance as himself in an episode of the television show Key & Peele. In 2014 he played himself in the lead role of the Tim & Eric's Bedtime Stories episode "The Endorsement." Prior to acting, Schwartzman was the drummer and a songwriter for the band Phantom Planet. Despite leaving the band, music remains one of his passions. He appeared in the music video for the rock remix of "It's All About the Benjamins" by Puff Daddy, and contributed to Ben Lee's 2005 album Awake Is the New Sleep. In 2007, he created the indie rock solo act Coconut Records. The first album, entitled Nighttiming, was produced by Michael Einziger and features a cover photo from Roman Coppola. The album was first released on iTunes on March 20, 2007. His second album, Davy, was released on iTunes on January 20, 2009. Schwartzman performed the musical score for Funny People and the theme song for Bored to Death. He has also written tracks for Smallville and Slackers. Schwartzman also played the drums on Phoenix's rendition of The Beach Boys' song "Alone on Christmas Day" in 2015. The song was featured in Bill Murray's Netflix special, A Very Murray Christmas. Coconut Records is an indie pop musical solo project by Schwartzman, which began in 2006. The debut album, Nighttiming, was released on Schwartzman’s Young Baby Records in 2007. The album had musical contributions by members of Incubus, as well as appearances by actresses Zooey Deschanel and Kirsten Dunst and Schwartzman's brother Robert. Coconut Records' second release, Davy, was released in January, 2009. Schwartzman's work has also been featured in many films and television programs. In 2009, he composed the theme song to his HBO series Bored to Death, in which he also starred, under his Coconut Records title. That same year, he also contributed to the film score to the film Funny People with composer Michael Andrews. The original soundtrack is downloadable, as well as available in vinyl LP, on Coconut Records' official Cinder Block store. His song, "Microphone" was featured in the 2012 coming of age comedy, LOL. Schwartzman has said in various interviews during South by Southwest (SXSW)[when?] that he is currently writing new material for Coconut Records and will be recording in the next year. "It's Christmas" is included on the digital-only promotional release The Christmas Gig (2010) released by Target. 2013 Palo Alto Song: "Is This Sound Okay?" ^ a b Bloom, Nate. "Interfaith Celebrities: Five Beautiful Women, A Violinist and One Caveman". InterfaithFamily.com. Retrieved September 15, 2011. ^ Fraser, Antonia (October 17, 2006). "Sofia's Choice". Vanity Fair. ^ "Jason Schwartzman on 'The Fantastic Mr. Fox': "It's the best movie I've ever been a part of"". Daily Actor. November 23, 2009. ^ Barrett, Annie (September 4, 2009). "Jason Schwartzman exclusive: Hear the theme song for his new HBO show here". Music-mix.ew.com. EW.com. Retrieved September 19, 2011. ^ DiNunno, Gina (August 21, 2009). "Jason Schwartzman Ties the Knot". TV Guide. Retrieved August 21, 2009. ^ Gilchrist, Todd (October 20, 2006). "Interview: Jason Schwartzman". Movies.ign.com. Retrieved September 19, 2011. ^ "What to Eat: The Environmental Impacts of our Food". PlateToPlanet.org. Farm Sanctuary. Retrieved July 17, 2012. ^ Michaud, Sarah (January 3, 2011). "Jason Schwartzman Welcomes Daughter Marlowe Rivers". People. Retrieved January 3, 2010. ^ Willis, Jackie (June 10, 2014). "Jason Schwartzman Welcomes Baby No. 2". Entertainment Tonight. Retrieved October 20, 2014. ^ "Cinder Block Store "Goats" Original Soundtrack LP (2012)". Cinder Block. Archived from the original on September 7, 2012. Retrieved March 5, 2013. ^ a b "Coconut Records – Chart History". Billboard.com. ^ "The 10 Most Stylish Men in America". New York Daily News. February 17, 2009. Retrieved February 17, 2009.